When I first started speaking and writing, I was 19 years old. I look back on those times now and I was just so naive. I’d grown up in sort of a bubble. What you realize very quickly, I think, is that life is messy. Life is messy. And it’s sort of one of the great themes of these 25 years of speaking and writing for me, this idea that life really is messy. And I can have these very clear and logical ideas in the solitude of my writing place, but real people in real places have to live them in real ways in the midst of what is very often a very, very messy world. At Dynamic Catholic, we invite the Ambassadors each month to submit prayers, and I get a report at the end of each week with all the prayers. It’s amazing, it’s astounding . . . I mean, I can’t even put into words what it feels like to sit in the chapel and read through those prayer requests. I cannot get through a set of those prayer requests without tears. It’s just not possible. It just, it couldn’t be human. And I think the lesson is that everyone’s struggling with something. I remember when I first got cancer. I remember walking out of the doctor’s office after he told me I had cancer. My head was just spinning, and my realization was that nothing else in the world has changed. Everyone is just going around their business, going about doing their thing. Nobody knows what you’re struggling with, and nobody knows what I’m struggling with. We’re all struggling with something. And I think it’s important that we realize that everyone’s carrying a heavy burden. It’s important that we realize everyone’s struggling with something. It’s important that we realize that everyone is fighting a hard battle. Because when we do realize that, we treat people differently. So be gentle with yourself, because you’ve got your own struggle. And be gentle with other people, because everybody is fighting a hard battle. Because life is messy. Everyone you meet is fighting a hard battle and carrying a heavy load. Be gentle with the people who cross your path. If someone is grumpy or rude, if someone makes a mistake or does something wrong, give them the benefit of the doubt. You never know what they are carrying around inside. Jesus, thank you for giving me a hope nobody can take from me. 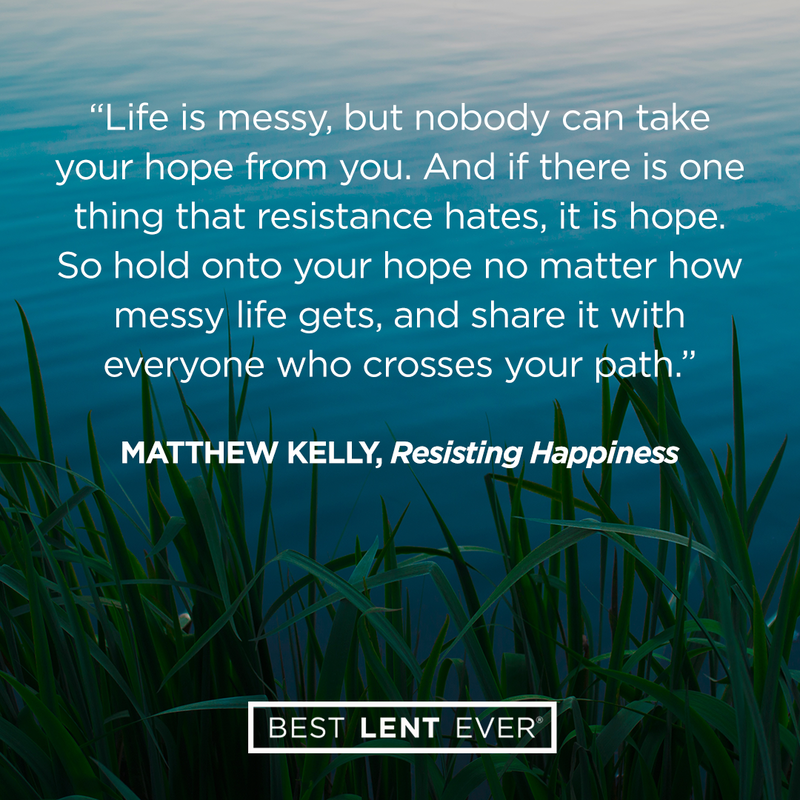 Give me the courage to confront my own mess and share that hope with others. Today’s personal reflection features Dynamic Catholic team member Fr. Bob Sherry. Fr. Bob is our chaplain and comes to us from Aurora, Illinois. He admits that he’s not very good at golf but that he can identify the bad guy in movies pretty quickly. Fr. Bob is looking forward to walking the Camino in May. What hard battle are you fighting?